JANIE MICEK is a Principal and Founder of Studio 818. As Creative Director Janie directly develops or oversees all designs for Studio 818. She is a licensed Interior Designer with NCIDQ (National Council for Interior Design Qualification.) Janie is a LEED AP (Leadership in Energy & Environmental Design Accredited Professional.) This is a Green Building credential that proves mastery in the highly specialized area of green building. The LEED AP exam materials are so voluminous that the reference guide alone is over 400-pages and testing so rigorous that it has only about a 30% pass rate. Janie began her professional career with a large commercial Interior Design firm in her hometown of Boston. She then moved cross-country to work in Los Angeles where her aesthetic was influenced by the architecture and eclectic design of LA’s oldest neighborhoods and the Mid-Century Modern majesty of Palm Springs. For over 15-years Janie has lived and breathed interior design, both commercial and residential. Her construction administration and project management experience ranges from one-bedroom condos to $100-million commercial projects. 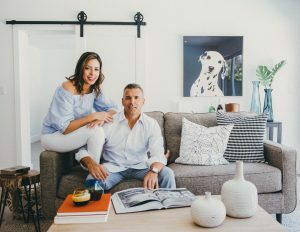 Janie’s direct development experience of Restore 818 investor-driven Designer Spec Homes gives her a value-driven perspective matched by few designers in the US. JOHN-PAUL MICEK is a Principal and Founder of Studio 818. As COO he oversees operations including; systems development, construction consulting, project management and construction administration. John-Paul has been in and around the construction industry since age 12. He founded three businesses before his 30th birthday, including a landscape design/build company specializing in residential projects with budgets between $350,000 to $1.2 million. Beginning in 1995 he has invested in, developed and managed over 200 real estate projects in New Jersey, Hawaii, Texas, California and Florida ranging from single-family homes to 350-plus unit apartment complexes. He is a licensed Real Estate Agent in the State of Florida working exclusively with Studio 818 clients to find, prequalify and purchase the right ‘fixer-upper’ or building lot through our Buy-It-Right acquisition consulting program.